Members of the Fayette County Memorial Hospital accounting team: Trent Lemle, CFO; Kim Kember, accounts payable; Bonny Mallow, payroll coordinator; and Aubrey Webb, accounting leader. Fayette County Memorial Hospital (FCMH) has again received the Auditor of State Award demonstrating excellence in financial reporting and compliance for 2017. This makes the second consecutive year FCMH has been given the honor. The Auditor of State Award is presented to local governments and school districts upon the completion of a financial audit. Entities that receive the award meet the following criteria of a “clean” audit report: The entity must file timely financial reports with the Auditor of State’s office in accordance with GAAP (Generally Accepted Accounting Principles); the audit report must not contain any findings for recovery, material citations, material weaknesses, significant deficiencies, Single Audit findings or questioned costs; the entity’s management letter contains no comments related to ethics referrals, questioned costs less, lack of timely report submission, reconciliation, failure to obtain a timely single audit, findings for recovery less than $100, public meetings or public records, and no other financial concerns exist. Fayette County Memorial Hospital is a critical access hospital (25 bed hospital) with over 30 healthcare providers, complete with a full spectrum of healthcare services. 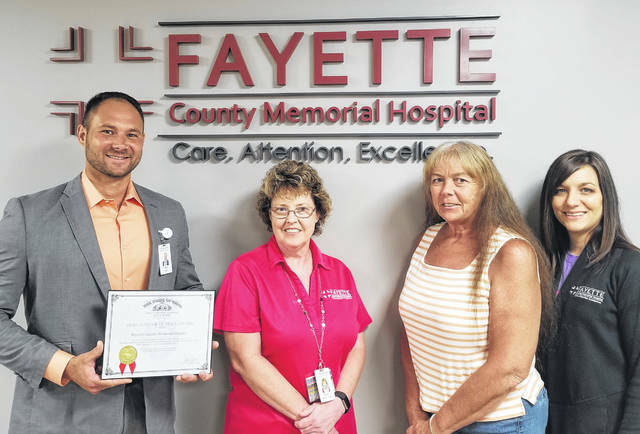 https://www.recordherald.com/wp-content/uploads/sites/27/2018/07/web1_7.13.18-FCMH-Audit-Award.jpgMembers of the Fayette County Memorial Hospital accounting team: Trent Lemle, CFO; Kim Kember, accounts payable; Bonny Mallow, payroll coordinator; and Aubrey Webb, accounting leader.